Summer’s almost here, and you can feel the anticipation of the season upon many people already. After all, it is time to start wearing looser and lighter clothing, not to mention spend more time out under the sun! Most folks would also find a day at the beach or poolside worth the effort, and if you have little children who do not yet know how to swim, it would be good to expose them to such an adventure – not to mention keeping them safe and sound. 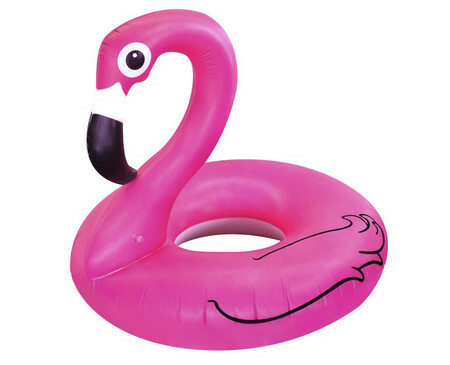 Go nuts with the $34.99 Giant Pink Flamingo Pool Float, where you might even want to hijack it from your little one as crowds flock to it, especially the scantily clad ladies in bikinis. It is bright pink and measures 5 feet wide, being made from extra thick durable vinyl.